View your caller’s journey to your website and the session data which led to the phone call. The new visitor details section also provides a wealth of cookie data, analytics data, and other 3rd party information. We’re continuing to develop the visitor detail section and feedback is always appreciated. Call Reports now have an “other” column for additional page information. Example: If you have 20 tracking sources, the graphs will report on all 20 sources information, even though we only display 10 tracking sources per page of the report. Grouping the additional page information into its own column provides consistency in graphs, better transparency to the data reporting, ultimately leading to a better user experience. This log will automatically document changes made to the account by user and date. For instance, if a tracking source UTM parameter was updated or if a new agent is added to a call queue, you will be able to see the history of those edits and who made them. The Change history is located within the items tab in the upper left-hand corner. 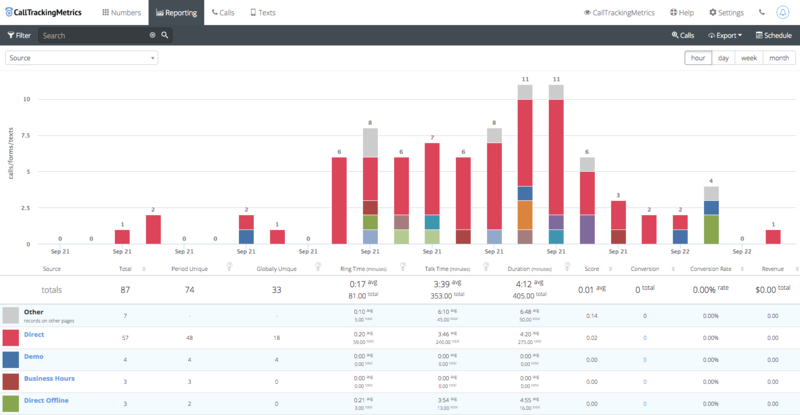 With the new Agency Call Log, agencies are able to view call data across all sub-accounts in one place. Allowing agency admins to effortlessly view all of their agencies’ calls without needing to jump from sub-account to sub-account. The Agency Call Log can be found under the Calls Tab in the main navigation.